U-Line modular 3000 Series. 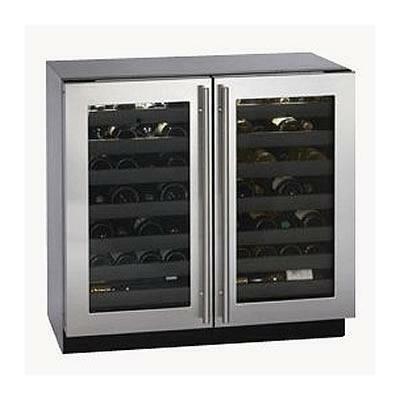 36" Wine Captain® with dual-zone convection cooling system, holds up to 62 bottles. Features black interior with LED theater lighting, solid beech wood, graphite finished, full extension black vinyl coated wine racks and temperature setting from 38 to 65 degree F.
Total 7.0 Cu. Ft. / 0.20 cu. m.
Additional Information -U-Select™ Control: Integrated OL ED display with intuitive user interface ergonomically located on top of door. -Beverage Mode: 38º to 65ºF, Sparkling Wine Mode: 38º- 50ºF, White Wine Mode: 45º- 55ºF, Red Wine Mode: 55º- 65ºF. -U-Select™ Control provides 4 distinct settings designed to provide precise refrigeration and maximize preservation. -Convection Cooling Technology. -Sabbath / Black-Out mode. -UL Residential Listing. -2 wine racks will fit larger diameter wine bottles, including Champagne bottles. -Black interior with LED theater lighting optimizes elegant display. -Solid beech wood trimmed, full-extension black vinyl coated wine racks allow for full access to stored wines. -LowE coated, argon gas filled thermopane glass door provides protection. -Robust, concealed and covered hinges with built-in door stop and closer. -Durable delrin feet on leveling legs glide easily on floor and reduce potential scratching.